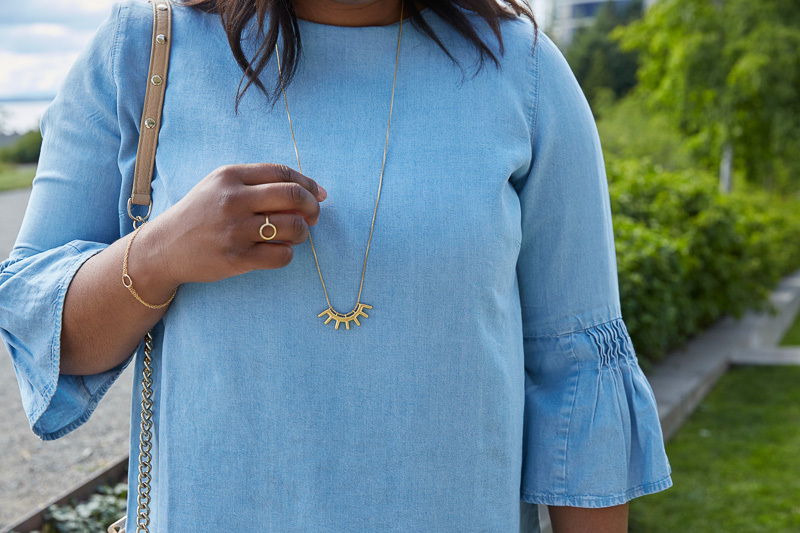 I used to have a love-hate relationship with the chambray and would not even think about purchasing one without seeing it in person. Chambrays are so variable in thickness and weight and I want to be able to touch and feel it first. 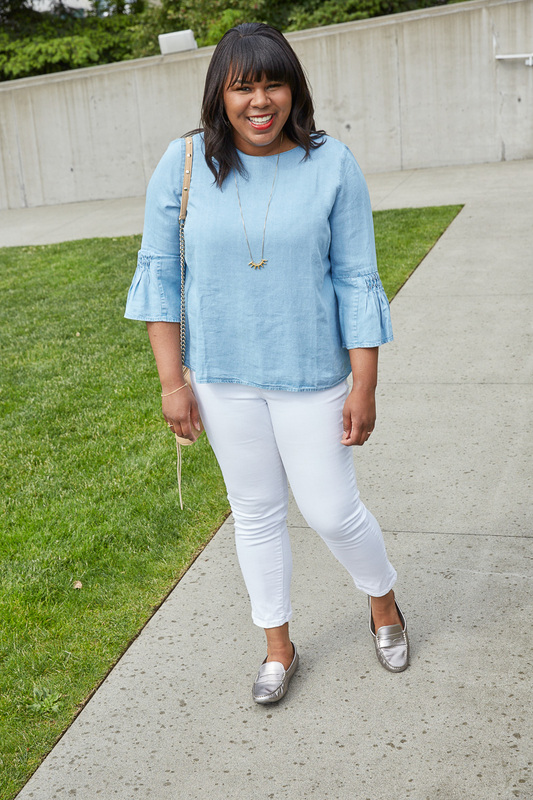 My favorite chambrays are this one from Old Navy and this one from J.Crew (and both are under $40!). 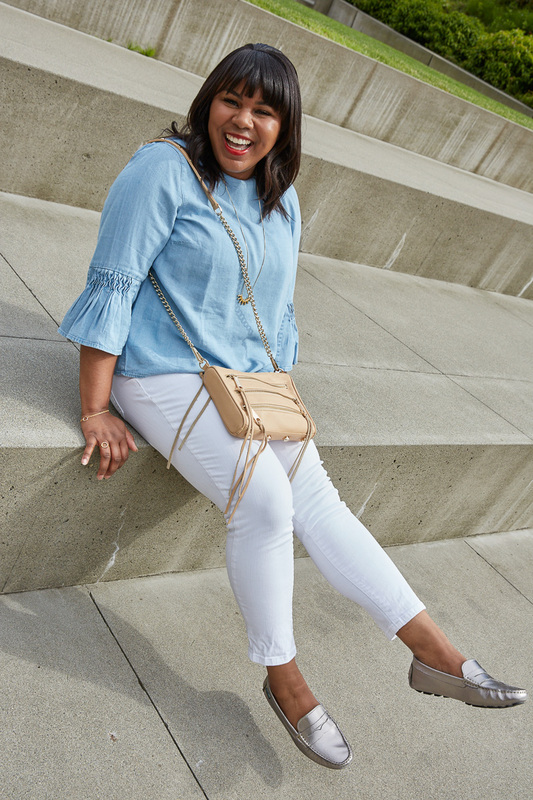 I’ve been an ambassador for J.Jill for over a year now and every month they allow me to pick a few items from their latest collection. 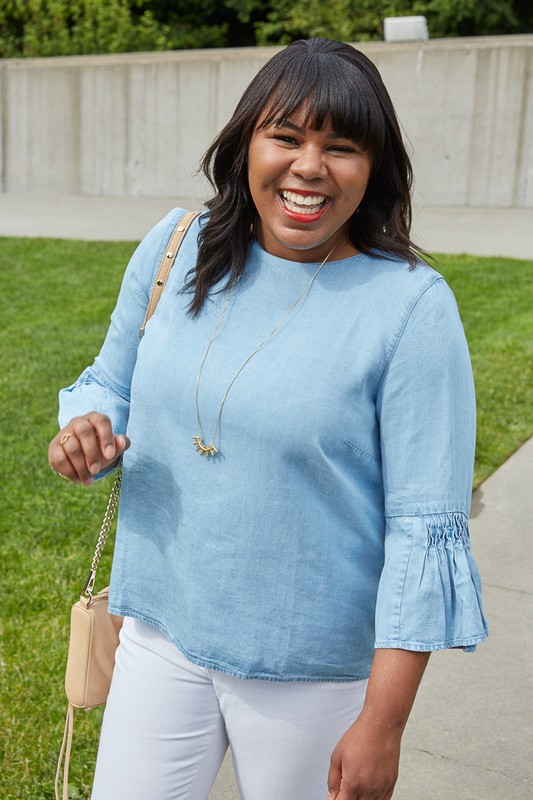 I was ecstatic when I received this pullover chambray with ruffled bell sleeves. 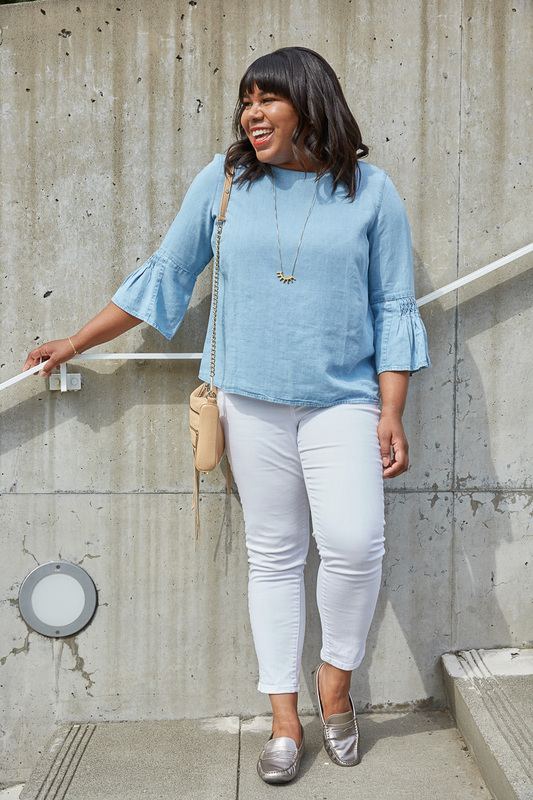 Finally, a chambray that was flattering and feminine! When I was first perusing their site, I happened to take a peek at the “Who We Are” section and found their history interesting so I wanted to share it with you. J.Jill started out in 1959 with only a specialty store in the Berkshires of Massachusetts and transformed into a direct catalog business. Forty years later, in 1999, they opened their first retail store and launched their e-commerce site the same year. They now have over 270 stores and are still thriving. J.Jill is women supporting women! In 2002, they founded the Compassion Fund to support community-based organizations to help disadvantaged and homeless women become self-sufficient. Since the launch, they have donated an excess of $14 million. 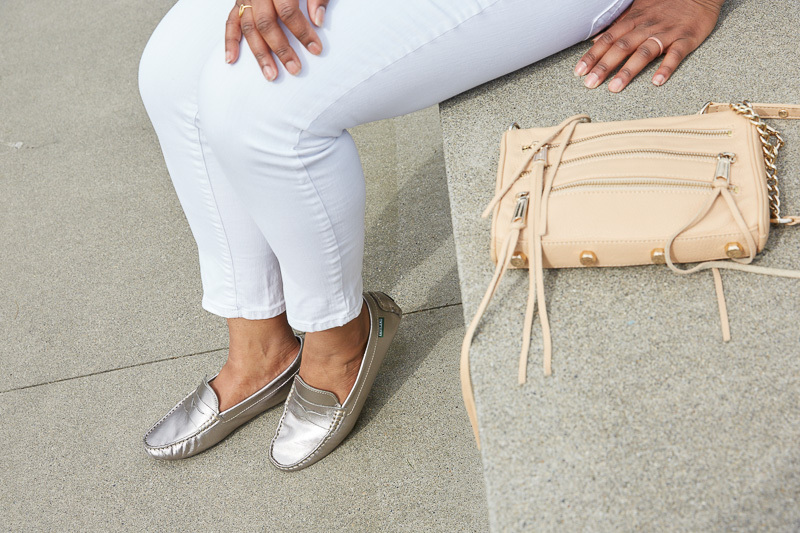 When you shop J.Jill’s Compassion Fund products 100% of the proceeds are donated to the cause. Up until last year, I didn’t own anything from J.Jill, but now I can’t get enough! The majority of their clothes are easy to wear and non-constricting. High quality. J.Jill quality can’t be beat! I am super impressed with the material and how well-made everything is. The price point is a bit high, but when shopping at J.Jill keep in mind that a lot of your items will be invested pieces and will last a long time. Size inclusive. I love a brand that has sizes for everyone. 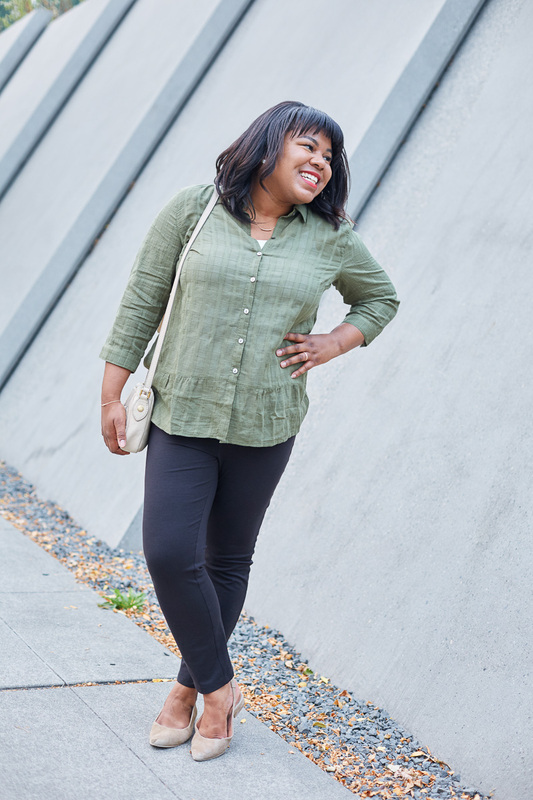 J.JIll carries misses sizes XS-XL, plus petite and plus sizes too. Now all your friends can shop at the same place! Versatility. As mentioned before, when I think about J.Jill, I immediately think easy to wear. The majority of their clothing takes the guesswork out of getting dressed. You can just throw it on and go! Cute shoes. I’m not sure if this is a new category, but I recently started receiving shoes from J.Jill and the designs are super cute! Unfortunately, this pair was a bit narrow for my foot and gave me the absolute worst blisters, but if your foot is on the narrow side then I highly recommend. So cute! 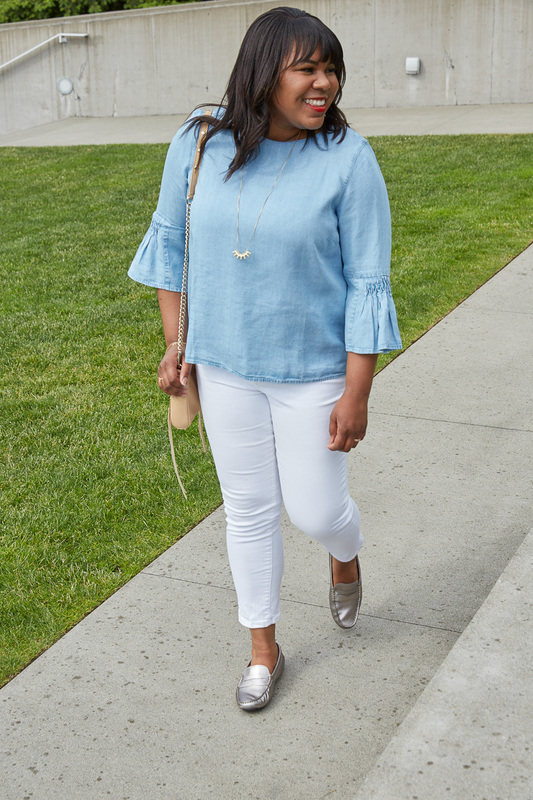 I love the chambray top from J Jill.You look good in it.I liked the info on the history of J Jill,so informative.I will have to visit their store soon.There is one in Kent Station.